Khongoryn Els also called Duut Mankhan is popularly known as the "Singing Sands". It lies within the Gobi Gurvansaikhan National Park in Mongolia. The sand dunes extend to over 965 square kilometres (373 sq mi) area. The dunes extending up to the foot of the high Altai Mountains range, lie about 180 kilometres (110 mi) from Dalanzadgad. It is at a distance of 130 kilometres (81 mi) along the desert tracks to Bogd in ÃvÃ¶rkhangai in the north, and 215 kilometres (134 mi) to Bayanlig on the northwest in Bayankhongor. Travel through the desert is either by camel rides or by jeeps with drivers who are knowledgeable about the desert. 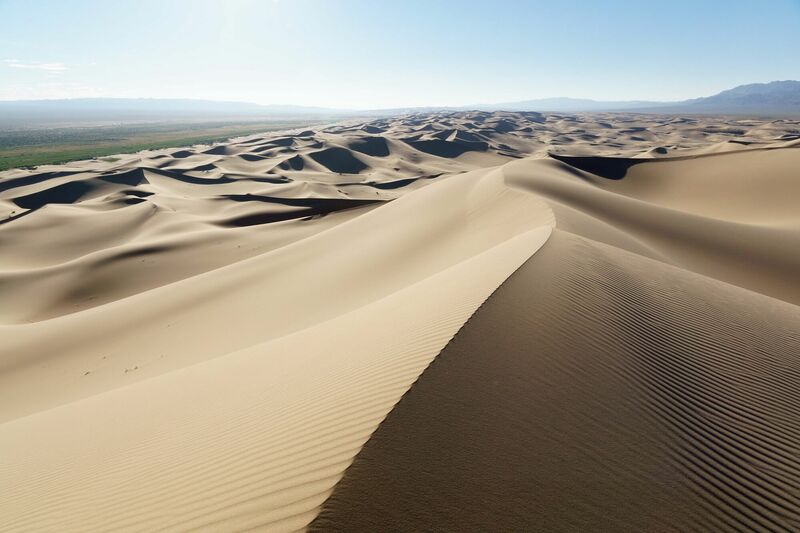 Mongolia has three types of deserts, and some of it has enough grass for livestock to graze, but the Khongoryn Els, in the extreme south of the Gobi Desert, has a huge range of sand dunes â 6â12 kilometres (3.7â7.5 mi) wide, 100 kilometres (62 mi) long (180 kilometres (110 mi) is also mentioned) and rising to a height of 80 metres (260 ft) (a maximum height to the apex can be 300 metres (980 ft)). They are similar to the dunes of Egypt. The sands have attractive curves which end in a sharp edge, making wave like patterns on the sand. They continually change shape due to wind and reflect yellow-white colours as the intensity of light changes during the day.